February has been a great month for factor index performance: of the 17 S&P 500®-based factor indices reported in our quarterly factor dashboard, 11 have outperformed the “vanilla” S&P 500 so far. Our indices focused on quality and shareholder return are having particularly strong months, with the S&P 500 Dividend Aristocrats®, the S&P 500 Buyback and the S&P 500 Quality indices all up 5% month-to-date. 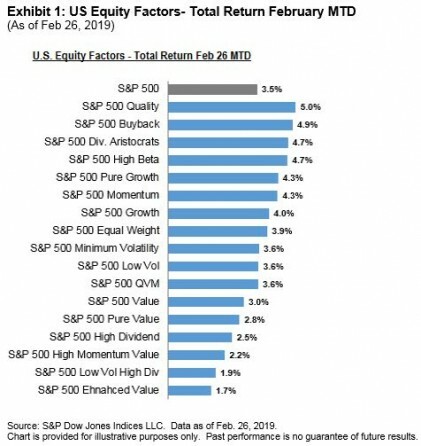 As regular readers of S&P DJI’s Indexology blog and SPIVA® scorecards reports know, we cannot all outperform the market: if some stocks are outperforming, some must be underperforming. Nonetheless, as shown above, so far in February a majority of factor indices are outpacing the benchmark. 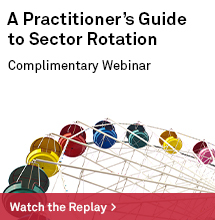 How can so many of our factor indices be doing so well? 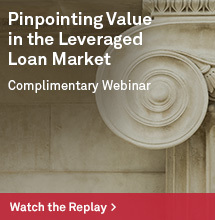 As we have argued previously, the clue might be in Equal Weight’s relatively strong returns. While cap-weighted indices measure the performance of the average invested dollar, they do not measure the performance of the average stock. As most factor indices don’t weight by capitalization, we would expect their returns to be closer to the return of the average stock than market cap weighted indices. By definition, the return of an equal weighted index is exactly equal to the return on the average of its component stocks. Moreover, the excess returns (or drag) realized by rebalancing back to “target” weights are frequently similar among factor strategies. 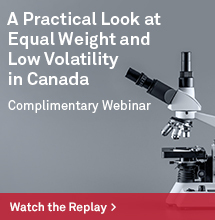 Given these similarities, when equal weight outperforms cap-weight, factor indices will also tend to outperform. Exhibit 2 offers some empirical support. To construct the exhibit, we began with the full set of indices shown in Exhibit 1, then pruned the group in order to avoid double counting. For example, I picked only “Pure Value” and “Pure Growth” to represent growth and value styles, and removed multi-factor indices, resulting in 9 remaining distinct indices (excluding equal weight). Exhibit 2 shows the average performance of those factor indices for each calendar quarter (going back to 1995), conditioned on the relative performance of S&P 500 Equal Weight that quarter. 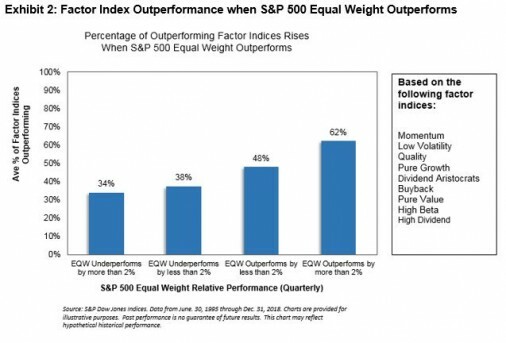 Historically, the greater the outperformance of equal weight, the greater the proportion of outperforming factor indices. 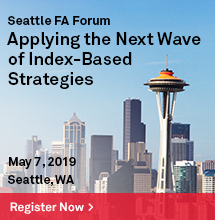 Though the relative performance of alternatively weighted indices cannot be completely explained by equal weight performance, equal weight indices are a key part our factor toolbox for assessing when (and how) factor indices outperform.